We relied heavily on the Pattern Language by Christopher Alexander for our kitchen design. This pattern defines an ancient kind of kitchen where the cooking and the eating and the living are all in a single space… Make [the kitchen] large enough to hold a good big table and chairs, some soft and some hard, with counters and stove and sink around the edge of the room; and make it a bright and comfortable room… Give the kitchen light on two sides. Cooking is uncomfortable if the kitchen counter is too short and also if it is too long… There is no need for the counter to be entirely “built-in” as it is in many modern kitchens – it can even consist of free-standing tables or counter tops. Dark gloomy kitchens are depressing. The kitchen needs the sun more than other rooms, not less… Place the main part of the kitchen counter on the south and southeast side so that sun can flood in and fill the kitchen with yellow light both morning and afternoon. Without communal eating, no human group can hold together…Make the common meal a regular event. The lunch can become an event; a gathering; something that each of us put our love and energy into on our day to cook. 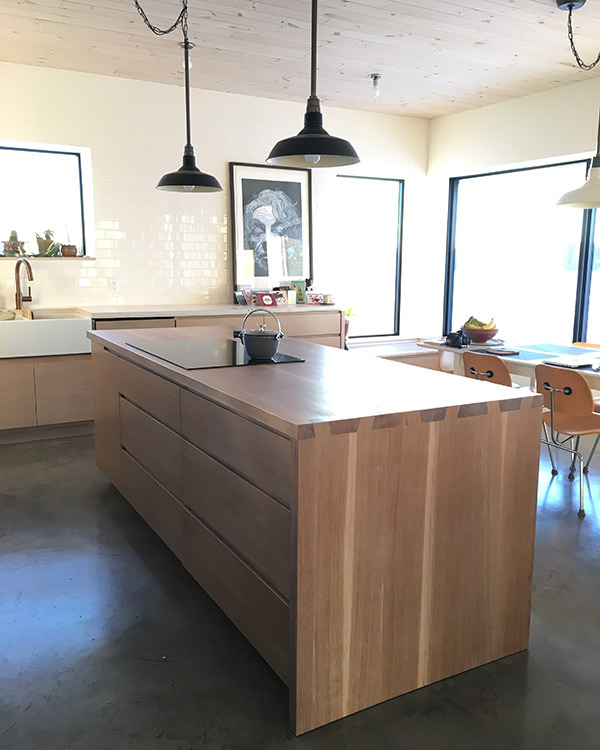 The kitchen island and lower cabinetry are all rift and quarter sawn white oak. We designed the kitchen with Ryan Unger of Rhine Artisans. A good friend and an amazing wood worker. It was really fun designing the kitchen with him. It was his suggestion to do the interesting Japanese dovetail joinery on the kitchen island. The pantry cupboards are a sprayed white maple. We had debated about natural wood here as well, but I like the transition of the white pantry cabinetry as it meets the white pine ceiling. Sometimes, rarely, there is such a thing as too much wood. I don’t know if you’ve ever tried to find bar or counter stools. It seems mandatory that they be either super ugly or crazy expensive. Darcie found these 3 for $40 on Kijiji and painted the upper legs and seats black. Above the fridge is an open cabinet to display items, cookbooks, and old witch hazel bottles. I’m not a fan of cabinetry hardware (same a counter stools – ugly vs. so pricy). 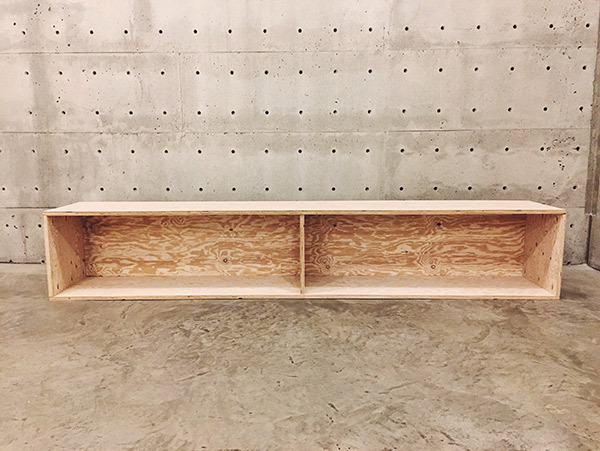 All of the lower cabinetry (primarily drawers, which are the best) have beveled edges on the top and bottom to easily open and close the drawers and doors. Also the corner cabinet is drawers. Yes it is. You lose a little bit of space, but man oh man, so much more functional. All of the appliances, with the exception of the dishwasher, are from Fisher-Paykel. The clean, simple and sleek lines complimented the simplicity of the kitchen design very nicely. They are mid-range price point, about on par with KitchenAid, and have good consumer ratings. We’ve been really pleased with them so far. The dishwasher is Miele, which was actually ccheaper than the Fisher-Paykel dishwasher (that are notoriously prone to break down). We had a big old 100 year old farmhouse sink in our old house and loved it dearly. It was so big you could practically have a bath in it. If I could have taken one thing with me from that old house it would have been that sink. No matter though we found a close second in this 33″ wide fireclay sink from Alfi. I like the double sink too – much less wasted water. The faucet was a splurge for us: Bronze-finished Brizo Solna. We have a LOT of counter space. The last few places we lived had absolute minimal counter space making cooking a frustrating experience. The Pattern Language recommends somewhere around 14 feet of counter space! To be safe, we did 16 feet. The outer counter is a poured white concrete. It has a creamy, organic finish to it and compliments the white oak quite nicely. The entire east wall and north corner (where the open shelving is) are tiled. We like to frequent (fancy hipster) coffee shops, the counter to ceiling subway tile, was certainly inspired by these places. Who doesn’t love a corner window seat? And, yes, that’s a bear skull on the counter… it’s vintage from the 70s though so it’s not that cruel… and it probably died of diabetes or something. I’ve had a few comments lately relating back to a previous post “Real Scandinavian White Washing” that I wrote awhile ago. A couple folks were asking if I could post some comparison photos of the woods we used in the house. All of these woods are in the same colour range, fairly light and soft. We do have some furniture with dark woods of walnut, cherry, and teak, but we wanted the palate for the house to be light and airy. A couple things to consider about wood is how it is cut as this can dramatically change how the wood will look and how it will take stain or oil. This image very nicely shows how distinctly different (in this case a red oak) can appear simply based on how it is cut. Plain sawn wood is the most common and affordably available wood as there is very little waste and it is easier to cut. However, oak is (or at least was) often desired as quarter sawn – giving very interesting “flecking” of the wood grain. A lot of heirloom antique furniture was made with quarter sawn oak. But this is only present on the very outer portion of the tree so it is generally less available. 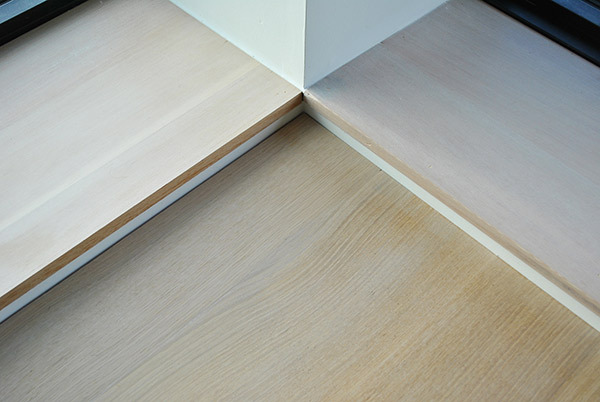 We chose to do rift and quarter sawn white oak due to the softness of the finish. I was not interested in any “wild” grain on the kitchen cabinetry. Plain sawn oak reminds me too much of the 80s/90s golden oak craze, which gave oak such a bad wrap for a long time. Rift sawn white oak has made oak cool again. We chose to do white oak on the lower cabinets, island and butcher block. 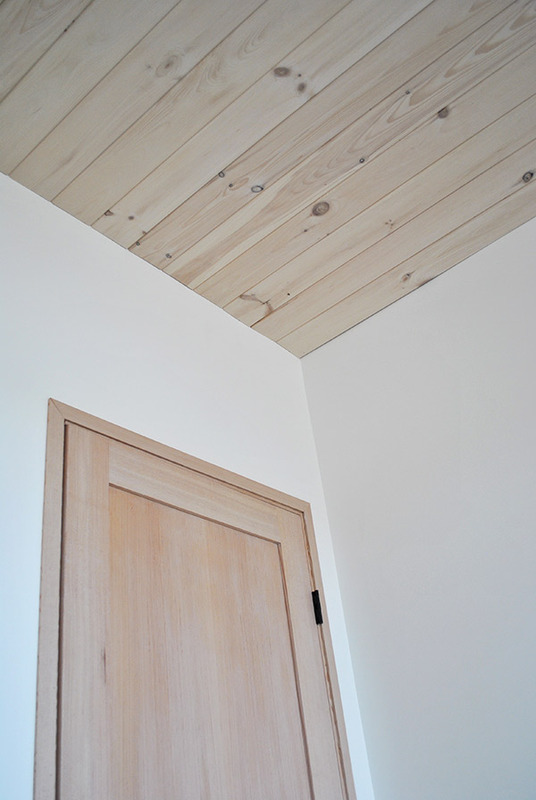 This photo also shows the lye-washed pine ceiling. 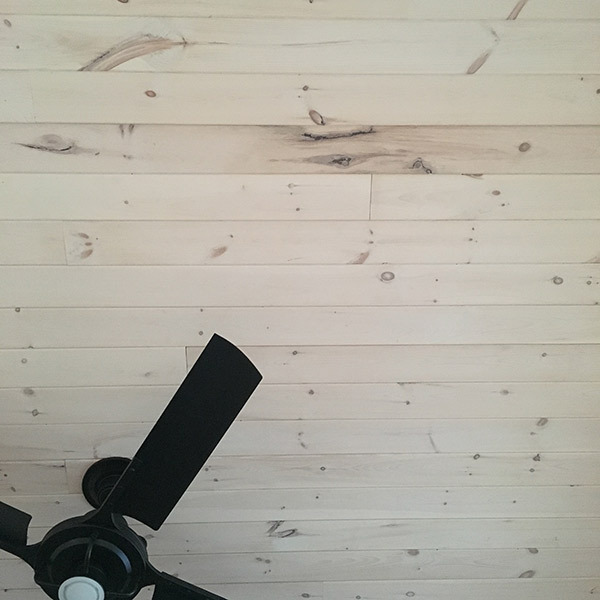 For the white pine ceiling, we only had the option of plain sawn and to be honest I’ve never seen pine as anything else other then this cut. Douglas Fir though might be one of the most interesting wood grains. It is DRAMATICALLY different as plain sawn or rift sawn. We chose to do rift sawn for the sills, doors and trim as it is more subdued. It also has a much tighter grain, making it appear pinkish in colour. However I built a little media box in plain sawn Douglas Fir – there is nothing plain about this grain though! It is bananas! This is a media box I built in the basement for the TV. This is CRAZY wild plain sawn douglas fir grain. I like it – in small doses like this. All of the doors on the main floor are rift sawn douglas fir. Comparison between the white pine and douglas fir. Comparison of rift sawn douglas fir window sills next to the white oak window seat bench. All of the woods shown we treated first with the WOCA wood cleaner to remove any crap, dirt, etc., and to open the grain to receive the next treatment. Everything was the brushed with the WOCA wood lye “white”. This is the key ingredient. The lye removes the yellowing agents from wood – these are the things that cause wood to discolour over time from white to yellow – as most lighter wood do (spruce, pine, fir, maple). The lye enhances the natural colour of the freshly milled wood. NOTE: An important consideration here though is that you need to keep the wood out of the sun before treating it with the lye. Even a few hours, and definitely a few days, of exposure of the untreated wood to UV rays will cause it to yellow. The lye won’t be able to help you much if the process of yellowing has already started. We were very careful to make sure the wood was covered and tarped during its transportation and we kept it in a dark area while it acclimatized before applying the treatments. All of the white pine and Douglas fir was then treated with two coats of WOCA master oil “white”. The oil penetrates the wood and protects it from dirt and wear. I much prefer oil-treated wood over varnished wood. The natural hand that you get with oiled wood is far more pleasing to me. The white oak cabinetry though was treated, after the lye, with a protective poly spray coating – standard for kitchen cabinetry. This is a clear coat so it does not change the colour of the wood, but simply provided a very strong protective layer to the wood. I’ll plan to post a some house tour photos shortly to give you an idea of the space. If you have not yet read my posts (rants) in Part 1 and Part 2, maybe check those out first. Have you heard of the Pareto Rule before? It’s more commonly known as the 80/20 Rule. It says that for many events, roughly 80% of the effects come from 20% of the causes. I think that Passive House (PH) follows this rule to a T. It has certainly been our experience in building an extremely energy efficient home and following the principles of PH. I believe that 80% of the benefits of PH come from about 20% of the cost and effort (from Part 1 of these posts, I noted that our financial cost was about 8% more than a standard house construction). Whereas to get that last 20% to the hit the PH certified requirements, you’re going to have to spend 80% more… At least this was my assumption. Still being the curious person I am and because I kept getting asked about it… I just had to know. How close does our house come to the PH standard? The only way to find out would be to either track the house over the next year or to have someone run the house through the Passive House Planning Package software (PHPP) to predict our values. As you may recall, we were never pursing PH certification, right from the beginning we were told the cost-effectiveness (80/20 rule) was just not there. Maybe if there was some incentive or rebate for going full-out, one could justify it. We were also told that there was no need to use the PHPP as it was too expensive. This latter statement however is simply not correct. I decided to ask around and see who could put our house through the PHPP for us. Or at least get a price quote for it. Maybe it would be too costly and so I wouldn’t bother if it was. After a few emails, I was eventually referred to a very well-respected PH consultant out of Alberta – Stuart Fix at ReNu Building Science. I sent my email explaining that we’d already built the house and so really can’t change anything now, but due to curiosity I was wondering if he could run the house through the software. No problem he said. The price we were given was entirely reasonable and was actually less than what we had paid to run the house through the inferior HOT2000 software prior to building. Crap! After a couple weeks we received the results, not surprisingly: we weren’t a Passive House. But the results on the various aspects of the house were very interesting and lead to some interesting points of discussion. So, you can see that the only criteria we met was the Total Primary Energy Demand. The blower door test we did later came back at 0.72 ACH (we’d run the software assuming 0.6 ACH as a target). As a result of the actual pressurization value, this would correspondingly increase the other values, but, for argument’s sake, let’s simply say that the Total Primary Energy Demand we either met, or were very close to meeting, while for the Heat Demand and Heat Load, we were WAY above the German PH maximum values. Build a larger home (!?! ?… small homes are the hardest to make meet an intensity based target, as they have the largest surface area to volume ratio. Meaning that a larger building squeezes more floor area into slightly more exterior envelope area, reducing heat loss per unit of floor area. The Germans do this to motivate one to build multi-family dwellings… but the result in North America has been a lot of larger single family homes getting certified). Ideally, if the insulation in all areas of the building cost the same, you’d want to balance the R-values so that the heat loss intensity rate is the same through all envelope elements. Your exterior above grade wall has the highest relative rate of heat loss, so that’d be the place to add more insulation first if you want to improve performance. If you want to optimize R-value ratios this way, it’s smartest to add in the cost/ft2 of each insulation type, then you can maximise your return on investment. For example, adding 1″ of cellulose in the attic is much cheaper than an inch of foam outside of a wall. The glazing of course has the highest rate of heat loss, but that’s just because you max out at around R10, where your opaque assemblies are R50+. Your North, East, and West windows are NET losers of heat, while the South windows offer a net gain. This is as expected, and is really the basis of Passive Solar design, that a South window can actually HEAT a building throughout the heating season, with the right recipe. If you wanted to optimize the glazing further, you can add more South glazing while removing glazing on the other elevations (North being the biggest drag on efficiency), which will continually reduce the annual heating demand (how much energy is consumed to heat). This is a Red Flag area though, following this path of more South glazing will eventually cause overheating throughout the year. Prediction of overheating / discomfort is an area where the PHPP is very poor, and I’ve been burned in the past on some projects where we pushed the Passive solar too far in an attempt to reach certification. I now use IES<VE> as a energy modelling tool because of its ability to accurately predict overheating. All of this was very interesting and at the same time reassuring to me. Like many others, I had put a lot of credence on the PH standards as the be all and end all (even still despite reading and appreciating the issues I’ve previously discussed). It was good to hear that the assumptions we’d made were in the end in line with the reality of trying to build a PH in Saskatchewan. Even still there was one last thing that I just had to know… it kept coming up again and again. It was one of those pesky assumptions we kept getting asked about. And one of my recently reposted blogs on Green Building Advisor brought it back to my mind again… German windows. It is regarded that the German (or Polish and Lithuanian) Passive House certified windows are the creme de la creme of windows. They are attractive, heavy, thick (6″ wide! ), and expensive. But if you want to reach Passive House standards, you gotta have ’em! (Or at least that’s what they say). I felt a little bit guilty asking for quotes on windows that we were never going to buy, but my curiosity just couldn’t be helped. I wanted to know how expensive PH-certified windows would have been for our place. We’d heard outrageous prices of up to $80,000 for some homes. We tendered a couple of quotes and received a reply from Optiwin of Lithuania. The salesperson was exceptionally thorough and I was really impressed with his communication (which made me feel more guilty). After a couple of weeks I received the pricing back. I was actually surprised that the cost of the PH windows was only $17,000 CDN more than the windows we purchased from Duxton Windows. Although they would have been certainly way outside our budget anyway – they weren’t 400% more than the price we paid by any means (just a measly 75% more). Nonetheless, I really had to pause again and wonder, why? What would make these windows $17,000 better than the fibreglass, triple pane windows we got? The U-factors and solar heat gain coefficients were not that big a difference. Maybe the the locking mechanisms of the windows could get you a bit lower on your airtightness – but $17,000? How long would it take you to save on heating bills to justify that “investment”? All this being said, I’m happy to have answered my lingering questions and to confirm some of my assumptions. The bottomline, of course, though is that you want to be able to sit back and be happy with what is around you. To know that you did the best you could in building a sustainable home for the future.